"This is one of the 'impossibles' that we all love. 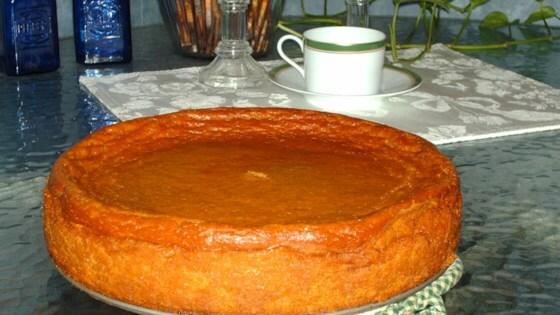 A pumpkin pie that makes its own crust!" In a large bowl, combine sugar and baking mix. Stir in butter, milk and eggs. Then beat in pumpkin, spice and vanilla to mixture until smooth. Pour into pie pan. Bake in preheated oven for 50 to 55 minutes, or until knife inserted in center comes out clean. Refrigerate any remaining pie. High altitude directions: Bake at 375 degrees F (190 degrees C) for 45 to 50 minutes. Been baking this pie for years! Blender is definitely the way to go (add wet ingredients first). I have been making this pumpkin pie recipe for about 15 years and it is still my favorite, I have never been much of a crust girl... you gotta have the cool whip on it though.